Over the course of your life, your body provides you with support, mobility, comfort and resistance to the rough and tumble of daily existence. Everyone expects to slow down as they age, and the body does the same. Degenerative conditions, such as spinal stenosis , occur in approximately 95 percent of the population. Spinal stenosis is most commonly caused by wear and tear, usually related to osteoarthritis, as you age. "Almost everyone gets this degenerative disease of the spine as part of the aging process. It’s a common diagnosis, however, most people respond to conservative treatments,” said Amber Hennenhoefer, DO, an HonorHealth specialist in physical medicine and rehabilitation. Pain in the limbs or when sitting is usually what causes you to seek a doctor’s advice. 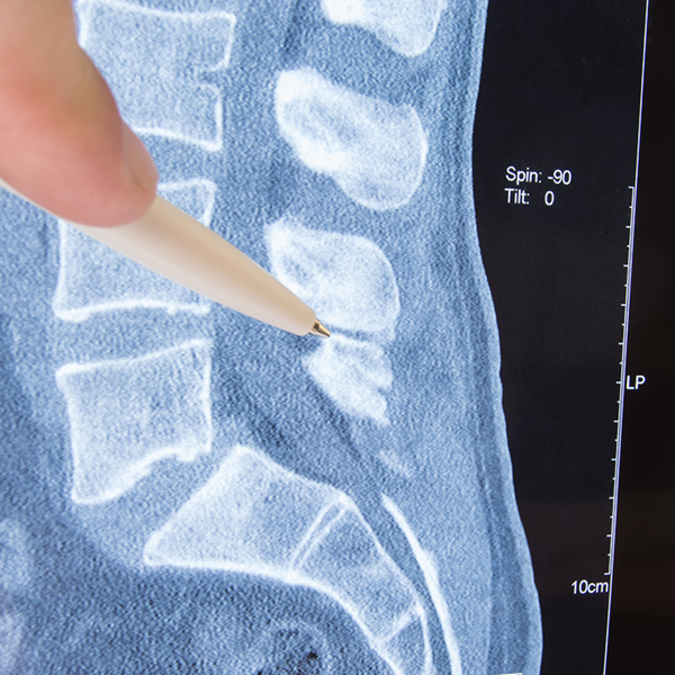 A special test can determine if spinal stenosis is the cause. But one sign is more obvious than the rest: "If someone can walk for a longer period of time or with less pain when they’re leaning forward on a shopping cart, it’s a sign they have the ailment," said Dr. Hennenhoefer. Nobody wants to hear that a disease can't be cured, but in most cases of spinal stenosis, treatments focus on alleviating uncomfortable symptoms. "Unfortunately, nothing can stop the progression of spinal stenosis," said Dr. Hennenhoefer. "But patients can benefit from treatment options." Dr. Hennenhoefer says you can live a normal life with a spinal stenosis diagnosis and can work on improving your mobility and comfort. "Spinal stenosis is an incredibly complex disorder, and there are entire textbooks written about the topic," said Gianni Vishteh, MD , a neurosurgeon and an independent member of the HonorHealth medical staff. "Some causes are degenerative, neoplastic (abnormal and excessive growth of tissue), infectious, congenital or deformity. There are multiple treatment modalities for each cause, so talking to a doctor about your situation is important." The first course of treatment for spinal stenosis is physical therapy along with pain and anti-inflammatory medication. "In physical therapy, we work on improving mobility and strengthening the core (to support the back)," said Dr. Hennenhoefer, "typically twice a week for six weeks in combination with medication." After having spinal stenosis for a long time, or when the condition continues to be very painful, steroid injections are the next option. If injections don’t resolve your pain, your next step is to get a consult for surgical options . Learn more about spinal stenosis and treatment options on HonorHealth’s website.